Henna is a natural product. Consequently, thanks to the absence of chemicals, the resulting colour of Henné Color henna powder differs per individual and even per treatment, as it can be influenced by conditions like natural hair colour, texture and even general health at time of usage. Rather than a radical change in hair colour, henna offers a more subtle effect, resulting in beautiful natural colours. 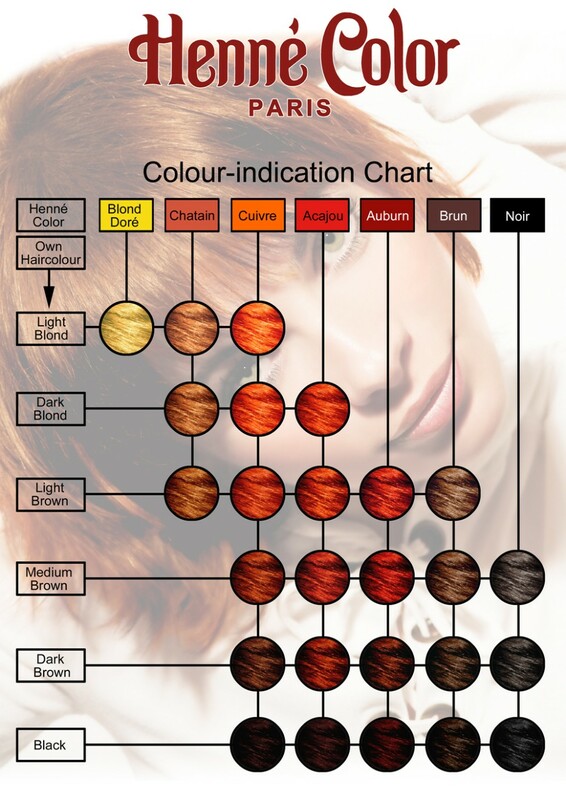 Our Color Indication Chart shows which colours are recommended for you, and gives you an idea of what the resulting colour will look like. When you are unsure if a resulting colour will meet your expectations, you can first colour a single strand of your hair. With grey hair, the result is dependend of the ammount of pigmentation still present in the hair. Colours may be brighter, or the colour may not take hold, therefore showing no result. In general, the best colour for covering grey hair is brown. When henna powder is no longer sufficient to cover your grey hair, you may try Henné Color's Colouring Cream. This product has better properties for covering grey hairs. This chart is meant to give an indication only; no rights may be derived from using it. The resulting colour may vary from the displayed colour on this chart.